“A US Navy physician shares his secrets for a more successful life in this self-help work. 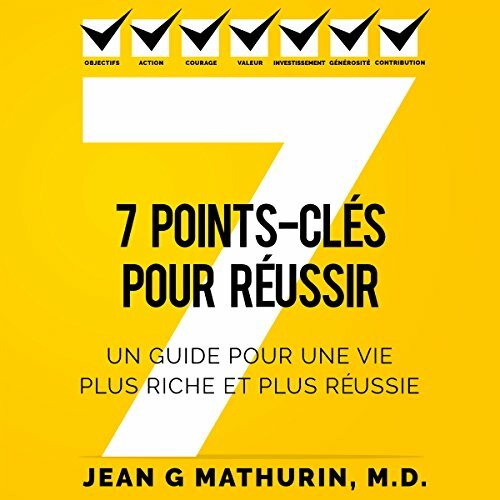 Mathurin conceived of his debut book when he realized how critical checklists are in the worlds of naval aviation and medicine. Itemized lists, he says, help avoid flight mishaps and operating room errors, so he wondered, ‘Why not apply this same concept to people’s lives to help them achieve their highest potential?’ That epiphany resulted in this book - a kind of instruction manual for living that breaks achievement into seven ‘checklist items: ‘Goals’, ‘Take Action’, ‘Courage to Consistently Commit’, ‘Value Resources’, ‘Investing in Yourself and Others’, ‘Giving Back’, and ‘Create a Legacy of Service to Others’. An introductory section helpfully explains each of the core concepts, in brief, and these same blocks of text are repeated at the beginning of each of seven chapters. The items themselves are unlikely to be new to most readers, as many of the ideas are common in self-help literature (such as ‘Have the courage to go the extra mile with everything that you do, each and every time’). But the presentation of the material feels more novel, as the overarching checklist concept isn’t taken literally; the book’s merit derives from the idea that one can systematically address several broad areas in the quest for a fuller life. At the very least, this notion gives the book a highly focused structure that makes it easy for readers to navigate. This book will show you the how and the ability to live a more successful life. This book echoes a sincere desire to use the lessons The author has learned as an dishwasher to now s Naval medical officer. The core concept of this book is that every individual is valuable and by seeking to improve the lives of people we all can make the world a little better. Ce livre constitue pour moi une source d’inspiration après avoir lu et écoute plusieurs livre en développement personnel. Je me sens fort et motivé. Prenez le temps de l’écouter.